Hello friends! Today my turn has come and I am delighted to share this wonderful yummy dish from Maharashtra. Ahhh, but wait, let me first take you back two months and tell you all about South vs North challenge. Aren't you curious? Our friend Divya pramil, has put up interesting challenge. Based on geographical location of India, two teams were formed. 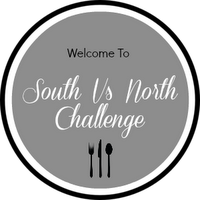 One for South and one for north and every month one person from both team would challenge the other team with there area's authentic dish and all the members of the opposite team have to make it one month time. Check out the details HERE. This is third month of challenge and this time from North team I am challenging my South team friends to try out famous street food of Mumbai which is Misal pav. In simple language Misal is mixture and its mixed in gravy and served with pav. I am sure all know the pav, am I right? 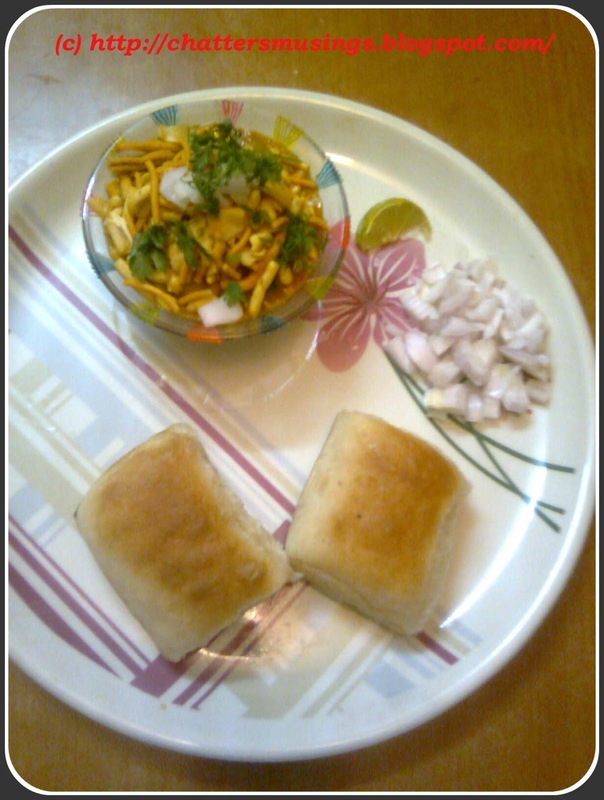 Misal is made differently in whole of Maharashtra using different ingredients but here I made it very simple with easy to get ingredients. Let me show you how its made. 200 gms dried white peas. Wash and soak dried white peas overnight. Drain water and add new water and boil peas to 1 whistle. They should be cooked soft but not mushy. Keep them aside. Chop onion garlic ginger and green chillies. 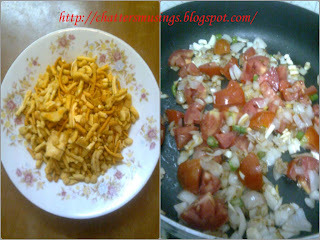 In a pan, heat 2 tbsp oil, add half of the chopped onion and rest keep aside for later use. Saute onion for a minute or two. 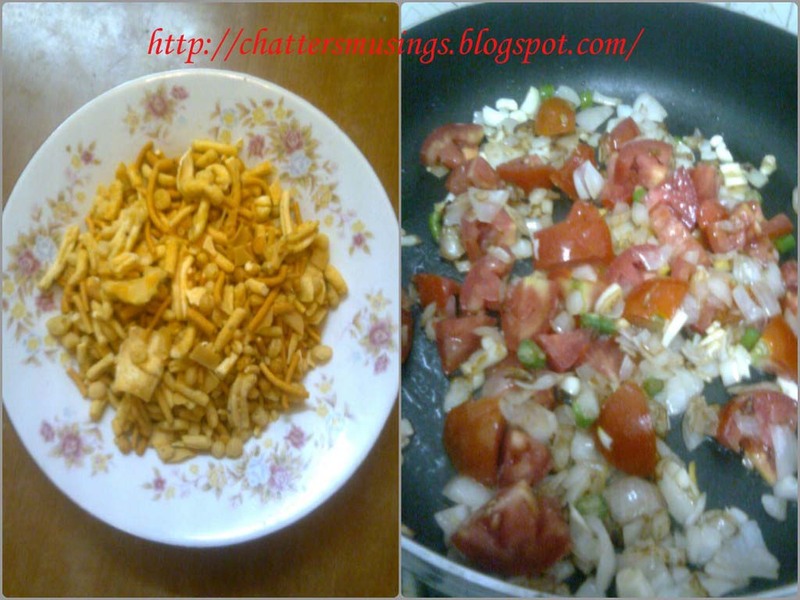 Add ginger, garlic and green chillies and again saute for a minute. Add chopped tomatoes and let it cook for a minute or two again. Finally reduce heat and add coconut powder or grated coconut. Mix well and remove in plate to cool. Grind this mixture to a smooth paste and keep it aside. In same pan, heat the remaining oil and add cumin seeds. 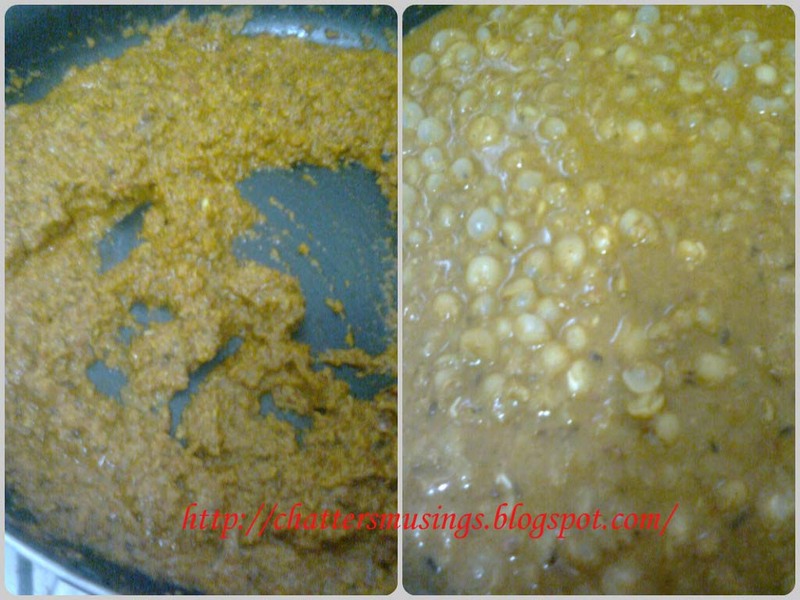 Once it splutters add the rest of masalas and saute it for half a minute. Be careful as masala would burn fast. To this, add the paste we made earlier and mix well. Add water as needed to get right consistency which is almost gravy type. Let it boil for a minute or two and add salt here. Do not forget the namak shamak. Finally add the boiled peas which we kept aside earlier. Mix and let it boil for few minutes till the dish looks like peas gravy type. Your usal is done here. Usal means just the gravy here which can be had as it is with pav. But we are making misal, so next part is easy now. In a bowl, put the usal gravy, top it with mix farsan and some of the remaining chopped onions, garnish with coriander leaves. Serve it hot with pav. Mix the things in the bowl and enjoy with pav. Simple enough, isn't it? So, when are you trying out? 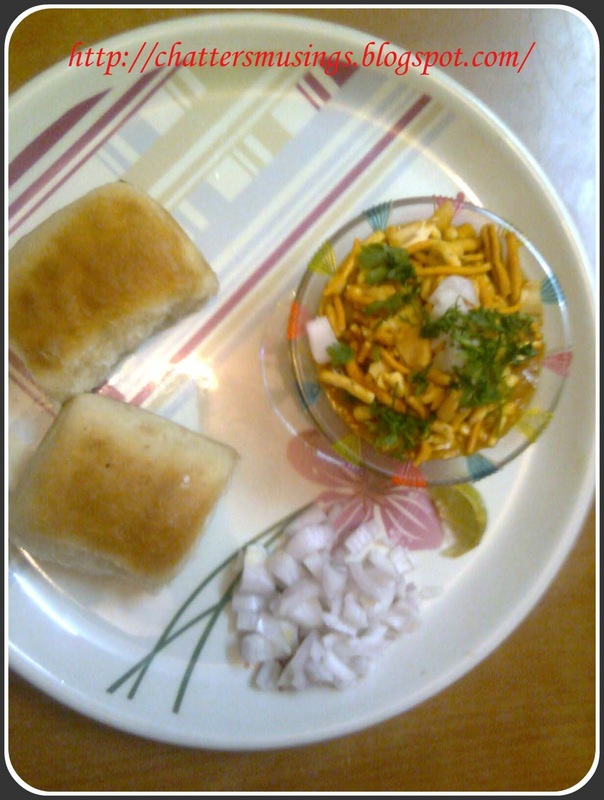 Misal pav is usually quite spicy in the interiors of Maharashtra and in some places instead of peas,sprouted matki or moth bean is used along with boiled potatoes. The masala also changes its way in the interiors. Misal pav is common street food in Mumbai and its full dish. 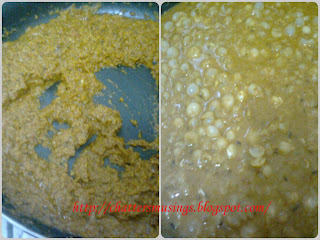 Mix farsan is mostly mixture and at most places chiwda is used but be careful as chivda tends to get soggy. 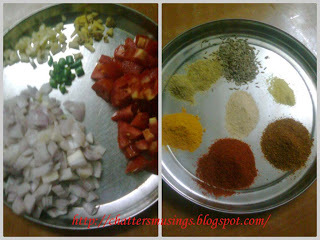 In the second post below I have put the pic of mixture I have used. 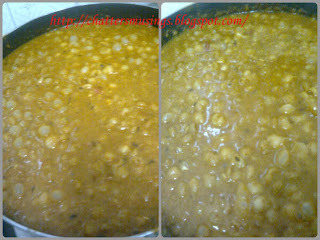 I forgot to take pic of dry white peas so just attached another one and these peas are also used in ragda patties dish. Do try out and any doubts, Mail me or use the Contact form above in the tabs. 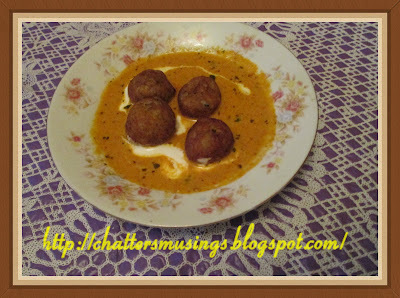 For north team members challenge is by Sherin for Medu vada. Click HERE to go to her place. really awsome meena sis:)tempting one.wil sure try it. Mouthwatering aunty!!! I love Pav baaji.. Hope I love this too :) Will do it soon ;) Thanks for this wonderful challenge !!! Meenaji! loved this recipe. easy to make and absolutely a kids favourite. Thanks! Wow! Quite Intersting Pav..Yummy treat.Soon I try. Am loving this challenge, also misal pav is in my to do list since a long,thanks Meena. Street food yummm. I luved the bhelpuri challenge and I'm sure I am going to luv this one too. Meena, thanks for the recipe dear. Also, can I use chick pea instead of white pea, I'm not sure if I've seen white pea on shopping aisles. Thanks Meena. I will try to get them. Never tasted this before and will make it soon..
hehh all the best waiting to see ur entry.. just make sure u eat when u r ready dnt mix and keep it before as whole mixture wud get soggy..
Hai Meena Nice street food recipe, I have all the ingredients rite now.It My son's fav ..
Wow ! Me the first to complete...:)..Southern Team do this dish fast and enjoy.. 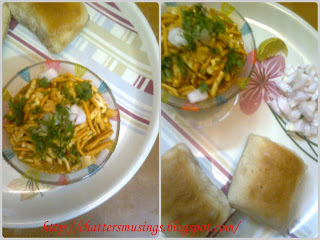 Thanks Meena for the yummy and tempting misal pav! long time can't have misal pav. Really feeling hungry now dear, by seeing this tempting and perfectly made misal pav dish. May I have now? Wonderful!!! Thank Meena just linked mine. I linked my entry ! Misal pav was great and rich in taste. I am new to this challenge first recipe itself was awesoem.I loved each and evry bite of this dish .Thank you for sharing this recipe with us. I am new to this challenge event would really love to be part of this challenge. I will try my to be part of this challenge. I have posted my first SNC. Thank you for giving me an opportunity to be a part of this challenge. I have posted my link and I hope I have done it right. Please check.